But Pauling made it appear otherwise. By the fall of 1951, he was ready to declare victory. Despite the fact that the British crystallographers were marshaling a good deal of evidence against Pauling's models for muscle, feather rachis, and the gamma helix, despite the finding in Bernal's lab that the alpha helix played a minor role in globular proteins (if it played a role at all), despite the fact that the Courtaulds people were questioning his work on synthetic polypeptides, and despite the growing belief that the gamma helix did not exist in nature, Pauling started working on a publicity blitz that would make his name synonymous with the discovery of the structure of proteins. He decided to play up the work in presentations at the largest gathering of chemists ever held, the World Chemical Conclave in New York City. The September gathering of 18,000 researchers from 42 nations (encompassing meetings of the International Congress of Pure and Applied Chemistry and celebrating the American Chemical Society's Diamond Jubilee) was a perfect platform for making a splash. To get ready, Pauling helped the Caltech news department write a six-page release touting his protein work as an important step toward "the secret of life." The American Chemical Society publicists, aware of Pauling's personal charisma and speaking ability, picked it up and made the protein work a centerpiece in their efforts to draw media attention. As a result, Pauling stole the show. The most heavily attended event of the Conclave was Pauling's address on protein structures. Reporters from major newspapers and a photographer for Life magazine were in the crowd. Pauling gave a flawless performance. The next day the headline in the New York Times read, "Chemists Unravel Protein's Secrets – Aid to Fight on Diseases – First Inroads on Mysterious Protoplasm – May Solve Basic Riddles." Two weeks later, the 5 million readers of Life opened their new issues to find an enormous photo of Pauling, a big grin on his face, pointing to his space-filling model of the alpha helix. The headline read, "Chemists Solve a Great Mystery." See Also: Untitled Caltech press release re: protein research by Pauling and Corey. September 4, 1951. 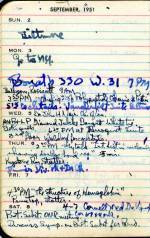 Pauling Diary: "Westinghouse 1951 Diary." 1951. Representation of the structure of feather rachis keratin. April - May 1951. "The discovery marks the establishment of the first major beachhead on nature's major stronghold - the structure of protoplasm, physical basis of life - which until now had remained impregnable."